I just went to see Tyler Perry’s “Peeples”, and I thoroughly enjoyed it. It had quite a cast with Kerry Washington, David Alan Grier, Craig Robinson, S. Epatha Merkerson, Melvin Van Peebles, (who I almost called “Van Peeples!” LOL), Diahann Carrol, Ana Gasteyer and my old friend, the beautiful, and talented Kali Hawk. 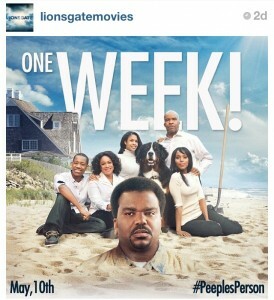 One of the posters portraying the star-studded cast of Tyler Perry’s “Peeples”! 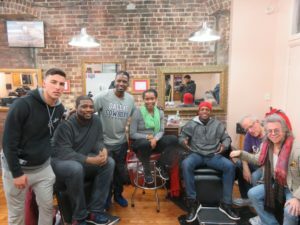 (L-R) David Alan Grier, Kerry Washington, Tyler James Williams, Kali Hawk, and Kimrie Lewis-Davis in Peeples! I remember her as a teenager, and how excited she’d be about watching stand-up comedy. 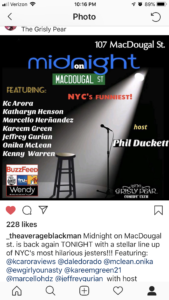 I have this vague memory of standing with her at The Comic Strip, in the doorway to the showroom, watching the acts, while she wondered if she could do comedy. I recall going to see her perform in plays at the Theatre for the New City on the Lower East Side. She was in high school by the tender age of 12 and in college before she was even 16. 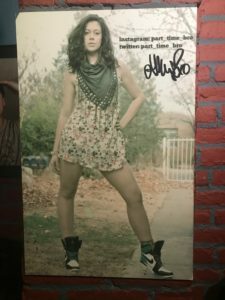 She started out doing commercials, but as gorgeous as she was, didn’t begin modeling until she moved out to LA, where she booked magazine ads and commercials for KFC, Clorox2, MTV Europe and was in several music videos for rock band Korn, Rob Zombie, Norah Jones, T.I., and Usher. It was only a matter of time until Kali made her way to the big screen. Some years passed between the time we spoke and then in 2007, I was out in LA for a party made by Kent Emmons for a book I wrote called “Filthy, Funny, and Totally Offensive” based on my writings for the Friars Roasts, which are notoriously raunchy, and Kali came to support me. 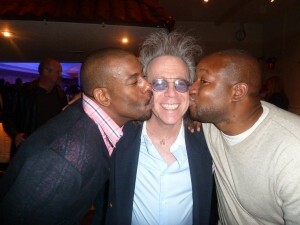 Jeffrey Gurian of Comedy Matters TV with Kali Hawk in LA, for a book party in his honor, in 2007! She looked so amazing I couldn’t stop taking pictures of her! She has grown into such an elegant woman! Jeffrey Gurian of Comedy Matters TV with Kali Hawk, who’s holding Jeffrey’s book “Filthy, Funny and Totally Offensive” but he didn’t let her look inside! Before “Peeples”, she was seen in the Lion’s Gate thriller ‘Holla’, alongside actor Michael Bergin. She would follow that project with a supporting role in the Spike Lee comedy “Lovers & Haters”, playing a scathing Hollywood diva opposite singer/superstar Mariah Carey, I saw her in “Get Him To The Greek” with Russell Brand, and Jonah Hill, and she played Trudy in “Couples Retreat,” another star-studded movie written by Vince Vaughn and Jon Favreau. On TV, she has also appeared on the hit CW sitcom ‘The Game’, executive produced by Kelsey Grammer, was accepted as a cast member for the ill-fated remake of “In Living Color” that unfortunately did not come to fruition, and worked with my boy Tony Rock, on a TV project he was starring in. 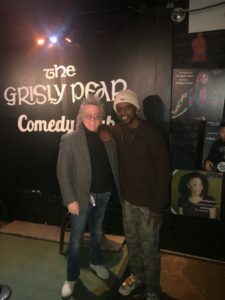 Tony was the featured performer in a sold out show at the Westbury Theatre on Long Island, that I co-produced starring the one and only Kevin Hart! (L-R) Jordan Rock, Jeffrey Gurian, Tony Rock, Richie Tienken and down in front Sherrod Small backstage at Westbury with Kevin Hart! 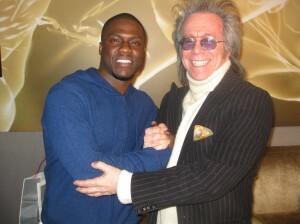 Jeffrey Gurian from Comedy Matters TV with Kevin Hart at a promo event for their concert at Westbury! Tony is also the new host of the Jamie Foxx remake of “Live At The Apollo”, aptly named “Apollo Live” shooting right here in Harlem, NYC! I went to the opening of the first season to cheer him on. Tony is amazingly funny, and the nicest guy you’d ever wanna meet! 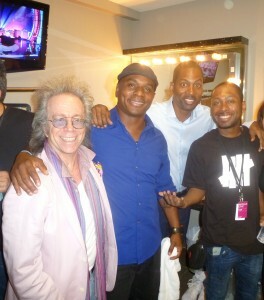 Jeffrey Gurian of Comedy Matters TV, Tony Roberts, Tony Rock, and Jordan Rock backstage at The Apollo! So “Peeples” was exciting to me because Kali had so much screen time. She plays Gloria Peeples the lesbian daughter of Virgil Peeples played so well by David Alan Grier. 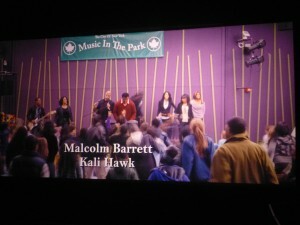 A cast shot of “Peeples” with Kali Hawk’s name on the big screen! Go Kali! I hadn’t seen David since last summer in Montreal during the Just for Laughs Festival when he came in to kibbitz with Adam Carolla right in the middle of my interview with him. It was actually funny, because the door was closed, and we were backstage after Adam’s show, but nobody’s gonna tell David that he can’t come in, so he did! (LOL) And it turned out very funny, because as I recall he was trying to distract me, and we all had a good laugh! Craig Robinson is also a great guy, and we did a cool interview together on the red carpet of the Comedy Central Comedy Awards. 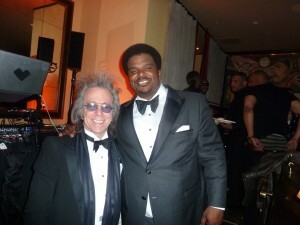 Jeffrey Gurian of Comedy Matters TV with Craig Robinson at a Comedy Central event at The Monkey Bar in NYC! I’m heading out to LA in about ten days to shoot my third appearance on Comedy Central’s hit “Kroll Show” and I really hope to be able to get the chance to congratulate Kali in person! The Apollo Theatre, on West 125th Street in NYC is a legendary venue known for “breaking” lots of huge talent over the years. It started as “Apollo Hall” in the mid 1800’s. 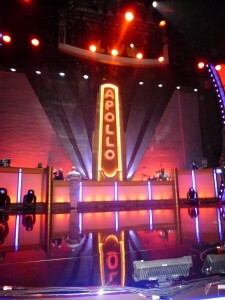 The new stage of Apollo Live at The Apollo Theatre in Harlem! It was always the pre-emiment showcase for African-American talent, which was definitely not a term that was used back in the 1930’s! The great Ella Fitzgerald made her singing debut there at 17 on November 21, 1934, which was the year it introduced it’s regular Amateur Night shows hosted by a performer named Ralph Cooper. Other stars that graced that stage at the beginning of their careers, as well as after they had made it, were Billie Holiday, James Brown, Diana Ross & The Supremes, Gladys Knight & the Pips, The Jackson 5, Patti LaBelle, Marvin Gaye, Luther Vandross, Stevie Wonder, Aretha Franklin, Ben E. King, Mariah Carey, The Isley Brothers, Lauryn Hill, Sarah Vaughan, and Machine Gun Kelly (rapper). 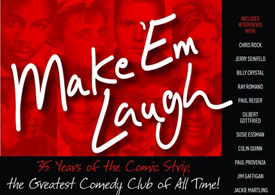 Comedy was also a big feature at The Apollo, and it spotlighted the performances of old-time vaudeville favorites like Tim Moore, Stepin Fetchit, Dewey “Pigmeat” Markham, and younger comics like Godfrey Cambridge, who some of my readers may never have even heard of. Jimi Hendrix won the first place prize in an amateur musician contest at the Apollo in 1964, but one thing The Apollo was always known for was how they rated the talent. In the early days, they had a guy they called “the executioner”. Audiences were encouraged to let the performers know how they felt about their performance either by applause or by the loudest booing you ever heard. If it was boos, the executioner would come on stage with a broom, and literally sweep the performers off their feet. Things haven’t changed much over the years. 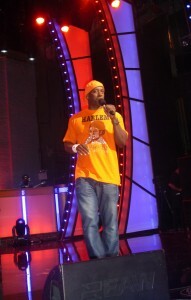 This Monday, July 9th was the debut of Apollo Live, Jamie Foxx’s remake of “Showtime At The Apollo” where aspiring singers put their self-esteem on the line, and come out to perform for audiences that have no qualms in standing up and booing, effectively drowning out the performance, while waving their arms motioning the performer to get off stage. 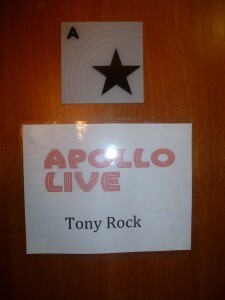 The sign on Tony Rock’s dressing room door, backstage at The Apollo! Tony Rock was chosen personally by Jamie Foxx as the host of this new show, to air on Centric, which is a spin-off cable TV channel of BET (Black Entertainment Television). I wanted to be at the first one, cause generally I like to go to the first one and the last one and see how it changes during that timespan. They will be shooting for two weeks. At this first show, Rob Stapleton was the warm-up comic and he is always great. Warming up the crowd is a specific talent in itself. Not every comic can do it. You not only need material, but you have to be really personable, and excellent at crowd work, which Rob is. I’ve seen him host several shows already and he’s always strong. The very funny Rob Stapleton warming up the crowd at The Apollo before Tony Rock came out to host the show! The judges were also fantastic and very right on the money with their decisions, even though the final decisions were left up to the audience. Michael Bivins from Bell, Biv, Devoe was one judge, Doug E. Fresh the rapper/beatboxer and inventor of “The Dougie” was a second judge, and the third judge, Gladys Knight, (without her “Pips”), got a standing ovation when she came into the theatre. She sat right near me and waved hello, ’cause everyone always thinks I’m in the music business. Anyway, Apollo Live is a really fun show. The audience was out for blood, and started booing some singers almost as soon as they started. Some of them made it through their song anyway. The guy who won for the evening was really the best, and Gladys Knight for one said he touched her heart with his voice. 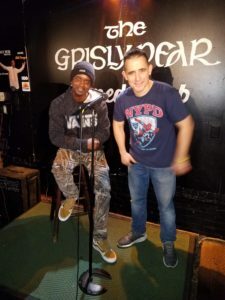 For a comedy break they had another Tony, Tony Roberts who I had seen recently with Cipha Sounds. Hot 97 was in the house, and after Tony’s spot he came backstage to shoot a promo for them. Seeing me in the dressing room, he pulled me on camera and introduced me as his real Dad! It was hilarious! Here’s the clip! 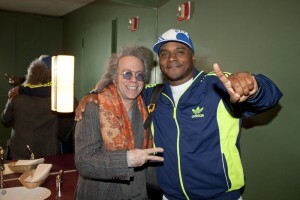 Jeffrey Gurian and Tony Roberts backstage at Cipha Sounds’ show at Carolines! 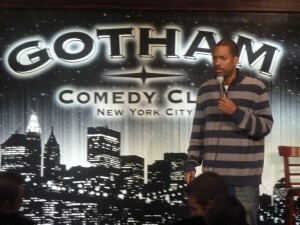 Tony Rock was a fantastic host. He looked slim and trim in a suit, and the crowd loved him. 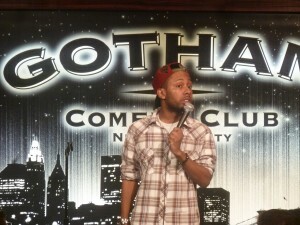 I went backstage afterwards with his youngest brother Jordan, who’s 21, and also a comic. 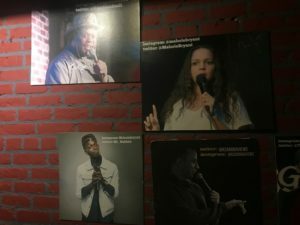 Jordan performs at The Comic Strip the same way that Tony Rock, and Chris Rock did all those years ago. 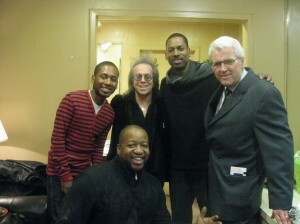 Jeffrey Gurian, Tony Roberts, Tony Rock, and Jordan Rock backstage in Tony Rock’s dressing room at The Apollo! I was excited for Tony, but almost even more excited for comic/actor Sherrod Small because he and Tony are like brothers, … even closer. They’ve been friends since early childhood, and started performing on the exact same night in July of 1998. And when they passed at The Comic Strip on the exact same night they hugged each other and cried on the corner, because they were so happy. 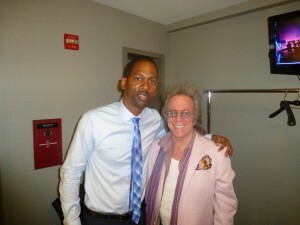 It was great to see the honest joy that Sherrod had seeing Tony onstage hosting a major show like Apollo Live. 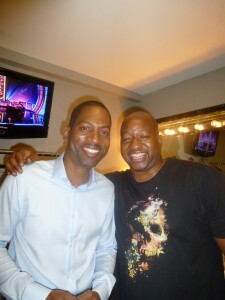 Tony Rock and his cousin and closest friend Sherrod Small backstage at The Apollo! I think this show will be a hit. Make sure to tune in, and check it out! 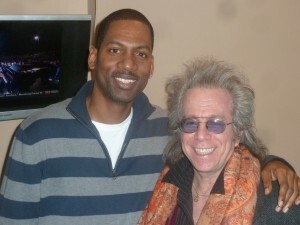 Tony Rock and Jeffrey Gurian from Comedy Matters TV backstage in Tony’s dressing room at The Apollo Theatre in NYC!